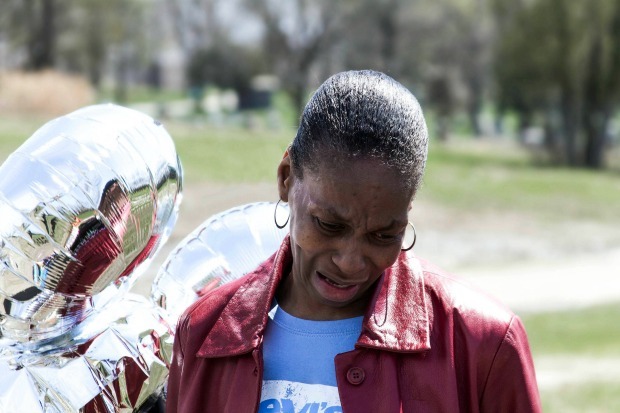 Rodney Stewart’s grandma, Sheila Green, looks down at Stewart’s grave at Mount Hope Cemetery. Stewart was 17 when he was murdered last year. Last fall 17-year old Rodney Stewart knew he was in danger and that he needed to get out of Chicago. Stewart had a plan. He was going to move to Iowa, where he could live with two friends and where he had a lead on a job. He bought a ticket for a bus leaving Chicago on November 10, 2012. But in the early morning hours of November 8th, just two days before that bus would have left, Stewart was found face down in an alley in the 2600 block of West 83rd Street, shot in the back of the head. He died later that day. Rodney Stewart’s family and longtime friends say they never expected his life to end this way. They remember him as an easy-going, silly but responsible young man. Stewart was a good kid, who stayed out of trouble, says Sheila Green, his grandmother; he wasn’t in jail like other relatives, she adds. Green says her grandson-- who came to live with her when he was 10-- actually liked to clean and go to bed early, and he had no problem taking care of his younger relatives or chipping in for groceries when needed. Stewart tried several times to get away from the dangers he feared would catch up with him. In May of 2012, he decided to move out of Green’s house to live with his mother. Green says the 16-year-old was seeking more freedom, and she didn’t approve of the move. When Stewart’s relationship with his mother grew strained, he moved in with his girlfriend, LaDorothy Morrison, and her family. When that family moved from their South Side Woodlawn neighborhood to the West Side in August of 2012, Stewart moved with them. In late October 2012, Green says Stewart’s school, Bronzeville Scholastic Institute, contacted her because he had missed 42 days of school, almost the entire semester. Green says the school told her that his mother could not be reached. Green talked to her grandson. She says Stewart told her he couldn’t go back to school and said he wanted to take classes online instead, something she reluctantly agreed to. Despite the increasing instability, school absences and repeated moves, Stewart’s girlfriend LaDorothy Morrison insists Stewart was trying to hang on and make something work. That resistance piques the suspicion of Stewart’s aunt Andrea Johnson. Johnson says she was close to her nephew. She blinks back tears at the mention of his name. She says Morrison is “not cooperating” with detectives and is therefore partly to blame for the fact that the case still hasn’t been solved. “The decision to bring charges in any case, murder or otherwise, is made by the State’s Attorney’s Office,” says Adam Collins, a spokesman for the Chicago Police Department. “The key pieces of evidence typically required by prosecutors include credible witnesses who is [sic] willing to come forward or DNA, which you don’t have with murder by gunfire,” says Collins. Andrea Watson is a Columbia College graduate student. She reported and wrote this story as part of the "Forgotten Dead" series, a Columbia College student project that looked into unsolved murders in Chicago last year.